Golf House Kentucky is actively seeking volunteers for the 2019 season! Since the founding of the organization in 1978, our volunteers, from Executive Committee members to club representatives to on-course officials, have been the backbone of the association. Although managed by a full-time, professional staff, Golf House Kentucky operates most efficiently with the services of volunteers who loyally assist the organization each year. The roles that volunteers play range from Course Raters, scorers and assistant scorers, receptionists, starters, spotters, and others. A volunteer is any person who is willing to help perform any one of a host of vital functions. There are many opportunities to get involved and to help in almost any capacity. The rewards are meeting new people, making new friends, seeing new venues, having a great feeling of contributing to the traditions of golf, and knowing that you have made an important contribution to the game we all love. The Kentucky Golf Association is licensed by the United States Golf Association as the governing body for amateur golf in the state of Kentucky. Among its duties, the association is responsible for the rating and measuring of all golf courses in the state as well as administering and overseeing the USGA Handicap System. 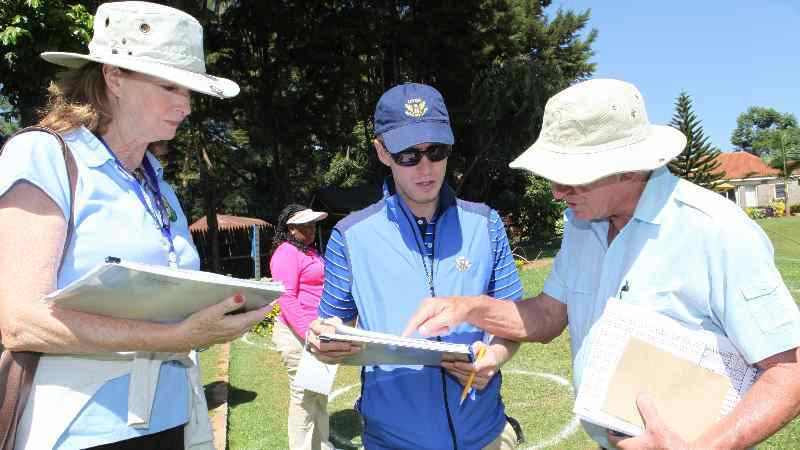 The KGA course rating teams are vitally important to the integrity of the handicap system, as the entire system revolves around accurate USGA Course and Slope ratings. Individuals who would like to serve as a course rater receive training before becoming part of a rating team. Volunteer raters may work one to four days monthly, usually mid-week to avoid crowded courses, in groups of four or more. Course rating consists of quantifying the difficulty of each hole on fourteen different factors for both Scratch (0 handicap) and Bogey (18 handicap for men) players. The team is attempting to predict the scoring of a scratch player and a bogey player. The difference between the two creates the Slope rating, the larger that difference, the higher the Slope. Rating requires the ability to recognize how various golf course design features affect the play of both low and high handicap players, all the while following the directives of the system without allowing personal inclinations to interfere with judgments. The successful course raters are analytical by nature and enjoy working with numbers. Additionally, they measure golf courses from teeing grounds to putting green surfaces in preparation for the course rating team to accurately determine the USGA Course and Slope Ratings. Upon the request of members clubs, the KGA will also measure for yardage markers, such as sprinkler heads, 100, 150 and 200 yardage markers, and from other prominent course features.